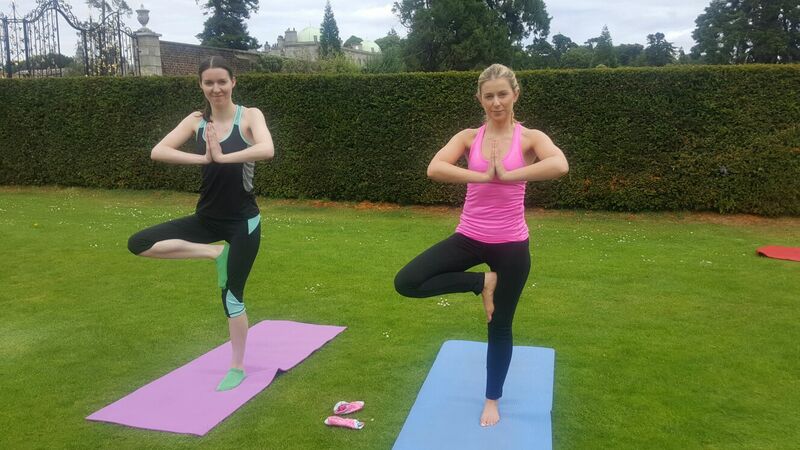 We enjoyed a two-hour yoga session in Powerscourt Gardens and with one of us with fifteen years of yoga under her belt and the other one not able to touch our toes, we both shared our experiences. 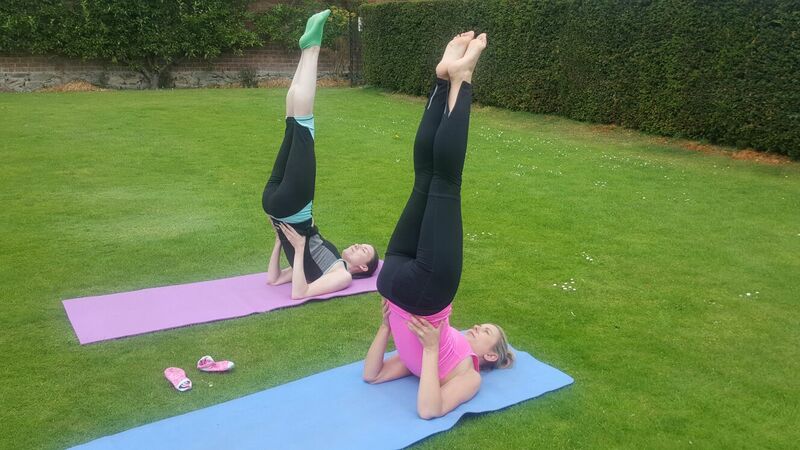 I’ve done yoga on and off for about 15 years, I even did some one-on-one classes in the past, pilates is my go-to now and while I did take a few great yoga classes at Pure Health in Ongar recently, I’m still a bit out of yoga practice! 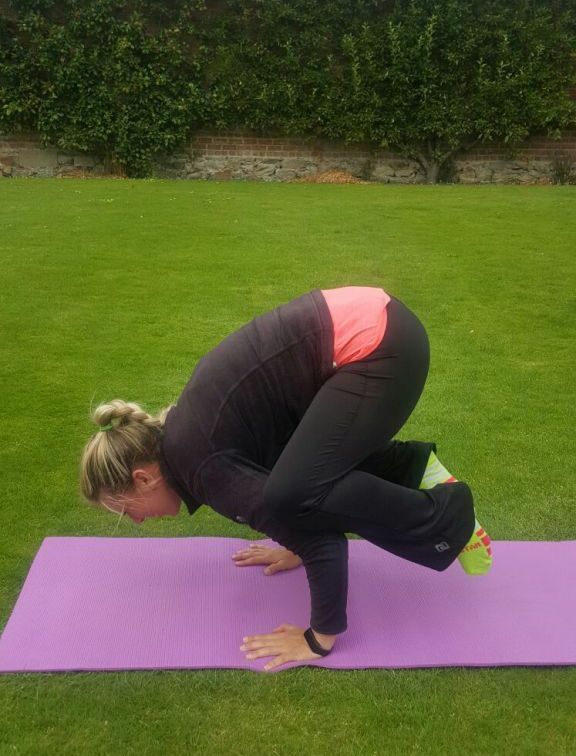 I’ve always loved the thought of doing outdoor yoga and when I saw it advertised in Powerscourt Gardens I was eager to sign up as that’s one of my favourite place to visit. It was down as mixed ability with beginners welcome so I didn’t expect too much of a challenge; Jenny has never done yoga before and I knew, while inflexible, she would be grand. It was a double class for the last week so ran from 11am to 1.20pm and was held in the wonderful walled gardens of the estate. We did quite a bit of stretching at the beginning, which was lovely yet challenging, I’m a nightmare for not stretching after long stints on the treadmill and for skipping the warm down/stretching sections of pilates DVDs, hence the slight struggle at parts of this section! The poses (asana) were more challenging than I expected, which was brilliant and the bubbly instructor was reassuring the class to only do what they could, so I wasn’t the only one who thought it was challenging. I struggled a bit with the balancing poses, at least on one side and I would usually be perfect at them, so that was a good reminder that your body is always reacting differently and no yoga practice is ever the same and you shouldn’t over push yourself. It also reminded me of how good yoga is for adding balance to your life, I should it more often. The relaxation part was really chilled and enjoyable and anyone who knows me knows I’m generally high energy and don’t always find it easy to fully unwind, so this part of yoga practice is often a challenge for me. My buzzing brain and busy, working lifestyle can cause my mind to wander but I did truly relax during this part of the class, however I missed the calming music you would have in an indoor class. Then we did some really nice breathing exercises, which was a pleasant surprise as I thought we were done after shavasana (corpse pose). Yoga breathing exercises are so good for calming and focusing the mind and detoxing your system. We also did alternate nostril breathing (pranayama), it is years since I did that in a class or practice, it’s hugely beneficial and anyone can do it. It soothes your nervous system, improves sleep, encourages a calmer emotional state, cleanses your lungs, improves brain function and calms agitation, it’s also excellent for relieving headaches and sinus issues. Overall the class made me remember my love for yoga and how exercise can and should be about so much more then losing weight or staying in shape, so I’ll be back on my mat ASAP! 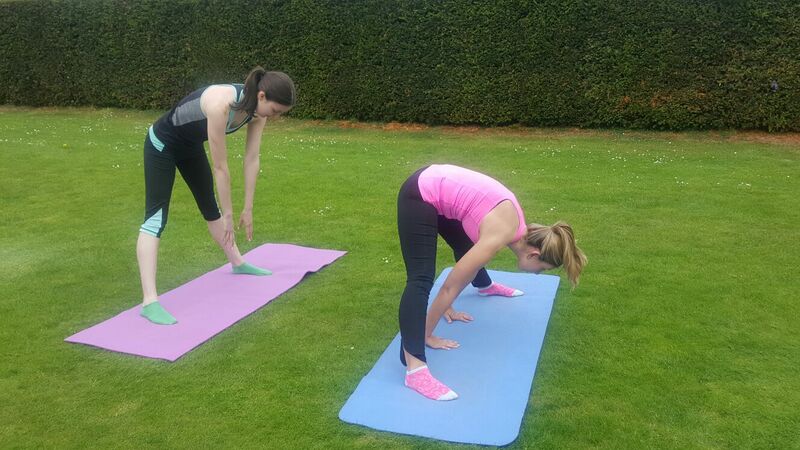 While I was really excited when Claire told me about an outdoor yoga session in Powerscourt. It’s such a gorgeous place and just the thoughts of doing yoga out in the gardens sounded relaxing. When we got there, I was actually quite nervous because I’d never been to a yoga class in my life, and every time people ask me to touch my toes, they think I’m over-exaggerating how bad I am. That’s genuinely as far as I could stretch. When we started I felt calm with the breathing exercises, although lying cross-legged was already making me aware of my stretching limbs (yes, I’m that bad). The rest of the stretches felt tough but they were starting to get easier the more I did and as we moved on to other positions, particularly standing ones, I found myself more able to at least attempt the positions and moderations. I found the class very mixed – judging by my mixed ability at all different stages – which was nice. I noticed others in the class able to do far more than me sometimes and others able to do less than me so we all had our strengths and weaknesses. But I found the class very relaxing, even though I had never done yoga before. The relaxation and mediation at the end was so relaxing I was worried about falling asleep! It was a very enjoyable morning, particularly being outside in Powerscourt on such a nice day. Word to the wise though; when the classes are on again, bring a little hoody. For some reason, Claire and I decided we would be grand and the odd shiver made some parts slightly less enjoyable so do keep warm. For anyone looking for a strong work out to burn calories, i.e. TRX or HIIT fans, this wouldn’t feel like enough but it was a wonderfully enjoyable practice that did leave some noticeable difference in some underused muscles the next day. The benefits of stretching, poses, breathing and relaxation through yoga include; (but are not limited to) increased flexibility, increased muscle strength and tone, improved respiration, energy and vitality, help maintain a balanced metabolism, cause weight reduction, improve cardio and circulatory health, drains your lymphs and boosts immunity, betters your bone health and for the anti-yoga extremists, marathon runners and cardio addicts; it also improves athletic performance and protects from injury. We would both highly recommend the teacher, Eike. She is really lovely and fun and most importantly very, very good. She runs yoga and pilates classes for all levels, caters for small groups and one-on-one lessons at Purely Yoga. We can never recommend Powerscourt Gardens enough; there are often different events on, which you can see here. It is also the perfect place to visit for a walk around the Internationally award-winning gardens, a quick look at the design loft and garden centre is a must, as is coffee and cake in Avoca.